Sometimes the non-beer drinkers give the most dead-on assessments of a beer, and that was the case for this one. Kristie, my wife, who despises all kinds of beer, usually gets to sample mine in case she has something brilliant or funny to bring to my attention. 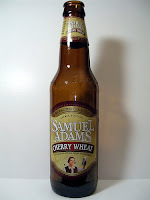 With the cherry wheat, she was able to pick up a flavor that was nowhere near the forefront of my mind: urinal cakes. Once she said it, though, I couldn't get it out of my mind. So does having a beer hater's opinion in your ear alter your opinion of a beer? You might say it does, but I've loved dozens of beers that Kristie would have spit out if I'd let her. It would be like taking marital advice seriously from Elizabeth Taylor. So I feel strongly that this beer would have made this list even without the urinal cake epiphany. I've previously stated my enjoyment of the sour cherry kriek taste, and this cherry is on the complete opposite end of the spectrum--sweet but dull, heavy and smothering. It's sticky in your mouth and the coating stays for a while. I've been known to compare beers to cough syrup, but I won't slap that label on this one. It simply isn't that good, especially from a brewery that is very visible and up front about its ingenuity and high quality. This one doesn't fit the "Brewmaster's Collection" title they've given it.